Nacogdoches City Hall is located at 202 East Pilar Street, Nacogdoches, TX 75961; phone: 936-559-2502. Photo: Roland Jones House, ca. 1897, 141 North Church Street, Nacogdoches, TX. As of May, 2015, the house was being operated as a Bed & Breakfast. Listed on the National Register of Historic Places in 1992. Photographed by user:Rwminix, 2011, (own work) [cc-by-3.0 (creativecommons.org/licenses/by/3.0)], via Wikimedia Commons, accessed May, 2015. Nacogdoches, county seat of Nacogdoches County, is located in the East Texas piney woods, approximately 50 miles west of the Texas-Louisiana border, 140 miles northeast of Houston, and 160 miles southeast of Dallas. The downtown sits on elevated and flat land which is surrounded by hills to the east and west. From the center of town, the land gradually rises to the north and gently slopes to the south. The Lanana and Banita creeks flow south on the east and west side of the original townsite, respectively, and converge just south of the downtown. The surrounding terrain is hilly and heavily timbered. Permanently settled in 1779, the community today covers nearly 22.5 square miles with a population exceeding 33,000. Nacogdoches' development has been characterized by slow, steady growth largely as a response to the timber and agricultural industries, and later as the home for Stephen F. Austin State University. The historic growth and development of Nacogdoches has largely been a result of its distinctive regional characteristics, land-use patterns and cultural forces. Early residential activity centered near the Sterne-Hoya Historic District. Development during the late 19th and early 20th centuries expanded to the north as represented by the Washington Square Historic District and to the west where the neighborhood including the Virginia Avenue Historic District evolved. A separate and distinct black neighborhood including the Zion Hill Historic District developed during the early 20th century northeast of the commercial center. In 1714 the French explorer Louis Juchereau de St. Denis followed a trail in East Texas that was originally blazed by Domingo Teran de los Rios in 1691. The road eventually became known as El Camino Real (later called the Old San Antonio Road), and stretched from Saltillo, Mexico, to San Antonio, across the Colorado, Brazos, Trinity and Navasota rivers through present-day Nacogdoches continuing to Natchitoches, Louisiana. The Spanish established permanent settlements along the route to guard the Spanish claim to East Texas. One of these was a mission named Nuestra Senora de Guadalupe de los Nacogdoches which was founded by Domingo Ramon in 1716. The mission stood approximately near the corner of present-day North and Muller streets. After several periods of occupancy, the mission was permanently abandoned in 1762. In 1779 Antonio Gil Ybarbo led a group of Spanish settlers back to the early settlement and renamed it Pueblo de Nuestra Senora del Pilar de Nacogdoches after a Spanish patron saint, Our Lady of the Pilar. Ybarbo subsequently erected a 2-story stone building on El Camino Real, which became known as the Old Stone Fort where he operated a successful mercantile business. El Camino Real, present-day Main Street, was the settlement's principal thoroughfare, much like it is today. Ybarbo laid out the town plan of Nacogdoches, and though he came without the consent of the Spanish government, followed the Spanish tradition by establishing a central plaza. He laid out the plaza with respect to the Indians well-traveled trails within the area. Consequently the plaza's corners faced northwest, northeast, southwest and southeast. The central plaza or Principal Square, as it was called, served as the public square where governmental and commercial buildings were erected. Ybarbo also laid out a second plaza known as the Religious or Old Church Square which was near the present-day intersection of W. Main and North streets. The Catholic Church of the Spanish period was built at this site, and a cemetery was set aside nearby. 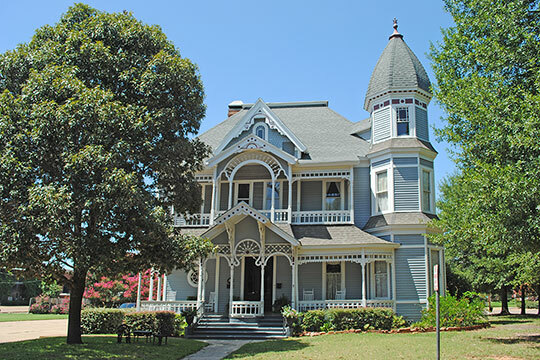 Although no properties from this period survive, Nacogdoches' Spanish heritage is still evident by the original town plan and many of the street names such as Pilar, Hospital, North and Mound. During the late 18th and early 19th centuries, Nacogdoches thrived as a small village on El Camino Real. The advent of Anglo-American migration to Texas by the 1820s brought more growth and many prospective settlers passed by way of Nacogdoches in search of new opportunities. Although most continued to other parts of Texas, some pioneers chose to stay in Nacogdoches and contributed to the town's development. The early settlers who came to Nacogdoches originally hailed from the Upper South, largely from Arkansas and Tennessee. Among these early citizens were Sam Houston, Adolphus Sterne, Thomas J. Rusk, John Roberts and Charles S. Taylor, all of whom later played prominent roles in Texas' struggle for independence. These and other new settlers helped transform the small Spanish village into a bustling, predominantly Anglo-American town. None of the Spanish-era buildings survive, however, they likely utilized different methods of construction, materials and/or detailing than those used by the Anglo-Americans who began to settle in the community. Nacogdoches' new citizens introduced building forms that reflected their heritage, examples of which still stand. The Adolphus Sterne House at 211 S. Lanana Street, for example, is representative of the kind of dwelling erected by the Anglo-Americans during the second quarter of the 19th century. This house was built in 1830 for one of the town's wealthiest and most influential citizens. It is based on a center-passage plan and is of wood-frame construction with Greek Revival detailing, a popular architectural expression of the period. In plan, massing and form the house was typical of those built by Anglo-Americans. David Moore, Project Director and Edward A. Galloway, Research Assistant, Hardy-Heck-Moore, Historic and Architectural Resources of Nacogdoches, Texas, nomination document, 1990/1991, National Park Service, National Register of Historic Places, Washington, D.C.